Barabati stadium is a cricket ground located in Cuttak, Odhisa. It is one of the oldest cricket ground of India, being established in 1958. It can accommodate 45,000 spectators on a busy day. The stadium is also used for hosting association football matches. 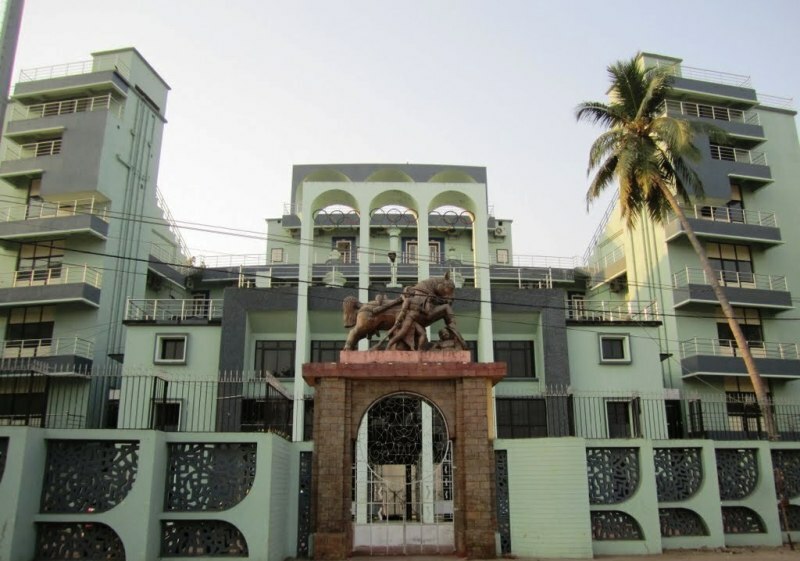 The Santosh Trophy national football tournament and several first division football matches are also hosted here. Barabati cricket stadium is owned by Odisha Cricket Association. The cricket stadium is currently home ground of Odhisa Cricket team and Kings XI Punjab cricket team. This stadium is also equipped with floodlights, making it suitable for day and night matches. The first ever match was played on 27 Jan 1982 between India and England (ODI). The first test match was played during 4-7 Jan 1987 between India and Sri Lanka. The Barabati cricket stadium has seen some historical moments. Kapil Dev took his 300th wicket on this ground by dismissing Rumesh Ratnayake. Dilip Vengsarkar scored his highest test score of 160. The ground is no longer hosting test matches; however the ground is hosting one day international matches at regular intervals. Barabati Stadium tickets for cricket matches can be booked online from the bookmyshow website or app. The website offers home delivery of tickets for some occasions, but generally we need to collect the tickets from box office. The international visitors have to collect their tickets from the box office. While collecting the tickets from box office, you might have to produce the card from which payment was made. The box office address is provided when the tickets are booked. The home delivery option is available for those having their home in well connected areas and also for people booking tickets in advance. The box office timing should be checked before visiting to ensure that the tickets are collected in time. The rush at box office can be a real pain sometimes so reach early. 1st match of India Sri Lanka T20 series will be played at Barabati stadium, Cuttack. Rest of the matches of this series will be played at Holkar Cricket stadium and Wankhede stadium. Check full Sri Lanka tour of India. The tickets for India VS Sri Lanka T20 match might be available for booking by offline and online modes. Generally, offline tickets are available at Barabati stadium ticket counter and selected bank branches or designated centers in city. Online tickets can be booked through various online ticketing websites, like bookmyshow, kyazoonga, ticketgeenie, eventsnow, etc. Online ticket receipt needs to be exchanged with entry pass available at box office or can be delivered at home. For ticket pickup, the box office address will be provided at the time of booking. The match between India Sri Lanka to be played in Barabati Stadium on 20 December 2017. The booking of the match tickets is expected to be open one week from the start of the match. The tickets should be available online and offline. Looking at the availability of tickets of recent matches, we can expect that online websites like Bookmyshow, evetsnow, etc will sell the tickets. India England match online tickets were available through get2thegames.com. While visiting the Barabati Stadium Cuttack for watching a cricket match, we need to take care of few things to make our experience better. There are few items which are not allowed inside the stadium, the list includes: earphones, eatables or drinkable, water bottles, metal objects, coins, power banks, charger, wires, cameras, plastic bags, binoculars etc. However, most of other items are allowed including: baby diapers, mobile phones, wallets, baby food, medicines, flags etc. we suggest you to avoid bringing unnecessary items other than wallet and mobile phones. The entry to the stadium generally starts 2-3 hours before the start of the match. It is suggested to reach the stadium before time to avoid the last minute rush. After collecting the entry passes or tickets from the ticket counter, check the gate number printed on it. Below is the stadium layout showing galleries, blocks, pavilions, etc. 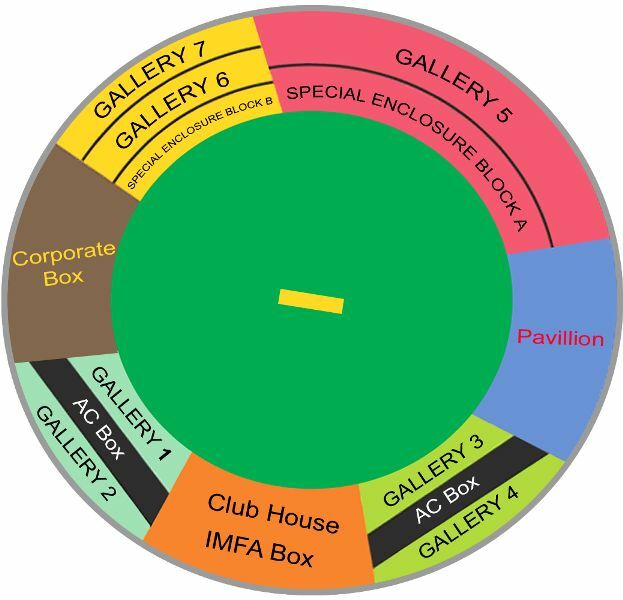 Layout map clearly depicts the pitch, corporate box, media box, AC box, club house, etc. The stadium has all the basic facilities. It is having a big enough cafeteria and the food quality is also good. The seats are also comfortable. The Barabati Stadium complex is equipped with washrooms and the stadium has facility of parking as well. It is suggested to use public transport for visiting the stadium. To avoid the heavy traffic jam at start and end of the match, public transport is the best option. For Tickets booking link click here.